British street preacher arrested for saying homosexuality is a sin. Which it is! He said he was not homophobic and has gay friends, but he feels compelled by his faith to urge people to abandon all types of sins so they can seek salvation. Christian campaigners said last night they were alarmed that the police seemed to be using legislation originally introduced to deal with violent and abusive rioters and football hooligans to curb free speech. Mike Judge, a spokesman for the Christian Institute, which is supporting Mr Mcalpine, said: ‘Dale is an ordinary, everyday Christian with traditional views about sexual ethics. Mr Mcalpine’s ordeal began when he and two other Christians went to the pedestrianised shopping precinct in the centre of Workington. He took a small stepladder and a rucksack of Christian leaflets and met full-time preacher Keith Bullock from Carlisle and a friend from his evangelical church in Workington. a number of stores and coffee bars. Mr Mcalpine said he and his church colleague handed out to passers-by leaflets explaining the Ten Commandments or offering a ‘ticket to heaven’. 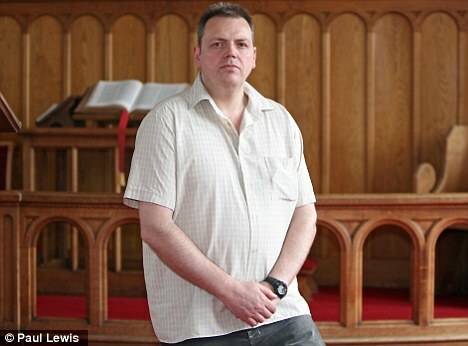 Mr Mcalpine said a woman came up to him and they became engaged in a debate about his faith, during which he says he recited a number of sins referred to in 1 Corinthians in the Bible, including blasphemy, fornication, adultery, drunkenness and homosexuality, as well as talking about repentance and salvation. He and the woman were standing close to each other and he said he did not raise his voice. Mr Mcalpine says that as the woman left, one of the two officers, PCSO Sam Adams, approached her and had a brief chat before walking towards him. Mr Mcalpine asked Mr Adams if everything was OK. According to Mr Mcalpine, Mr Adams said there had been complaints and warned him that if he made racist or homophobic remarks he could be arrested. Mr Mcalpine said: ‘I told him I was not homophobic but sometimes I did say that the Bible says homosexuality is a crime against the Creator, but it was not against the law to say this. Mr Adams has been a member of Cumbria police’s LGBT staff association and last year represented the force at the Gay Pride festival in Manchester, marching in the parade with a police dog named Whistle. On the social networking site MySpace, he describes his orientation as gay and his religion as atheist. Soon after midday, Mr Mcalpine took over from Mr Bullock on the stepladder and says he preached for about 20 minutes. He said he mentioned drunkenness and adultery, and that religions such as Buddhism, Islam and even Roman Catholicism were not the way of salvation, but did not speak about homosexuality. During the sermon he was heckled by a middle-aged man who berated his colleague Mr Bullock, asking what right he had to preach that drunkenness was wrong. At that point Mr Adams, who Mr Mcalpine said had been talking on his radio, intervened, and the man left. A few minutes later three regular uniformed policemen arrived and Mr Mcalpine said one asked him if he had made homophobic remarks. Mr Mcalpine said he told the officers that while he was not homophobic, he did believe homosexuality was a sin and there was no law against saying so. ‘I knew that I hadn’t done anything wrong so I told myself to remain calm, but it was very intimidating,’ he recalled. Mr Mcalpine was put in a cell and asked for his Bible. ‘I read it and sang hymns like Amazing Grace as loudly as I could,’ he said. Police took his fingerprints, a palm print, a retina scan and a DNA swab. He eventually saw the duty solicitor and was interviewed by an officer in a room equipped with a table, four chairs and a recording device. Mr Mcalpine was told that the two PCSOs had alleged that they heard him shouting that homosexuality was a sin, which had distressed them and members of the public. He was eventually charged under Sections 5 (1) and (6) of the Public Order Act 1986 and released on bail on the condition that he did not preach in public. At a preliminary hearing on Friday in Workington magistrates’ court, Mr Mcalpine pleaded not guilty and he is now awaiting a trial date. The two PCSOs are expected to attend as witnesses. Shoppers in Workington were bemused by what had happened to Mr Mcalpine. Rob Logan, the assistant manager of the O2 mobile phone store near where Mr Mcalpine preached, said he had no complaints. The Public Order Act 1986 has been used by the police in a number of similar cases, including that of Ben and Sharon Vogelenzang, the Christian hoteliers cleared earlier this year of insulting a Muslim guest at their Liverpool hotel. In 2002 pensioner Harry Hammond was convicted under Section 5 of the Public Order Act. When preaching in Bournemouth, Mr Hammond held up a sign saying: ‘Stop Immorality’, ‘Stop Homosexuality’, ‘Stop Lesbianism’, ‘Jesus is Lord’. In 2006, police arrested and charged Christian campaigner Stephen Green for handing out leaflets at a Gay Pride festival in Cardiff. The case was dropped. 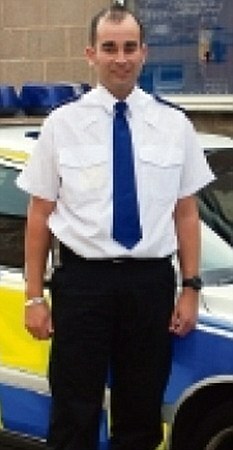 Last night Cumbria police said there was no one available to comment on Mr Mcalpine’s case. How long until Christians are blackmailed for daring to speak? Revolutions do not always involve guillotines or mobs storming palaces. Sometimes they are made by middle-aged gentlemen in wigs, sitting in somnolent chambers of the High Court. Sometimes they are made by police officers and bureaucrats deciding they have powers nobody knew they had, or meant them to have. And Britain is undergoing such a revolution – quiet, step-by-step, but destined to have a mighty effect on the lives and future of us all. The Public Order Act of 1986 was not meant to permit the arrest of Christian preachers in English towns for quoting from the Bible. But it has. The Civil Partnerships Act 2004 was not meant to force public servants to approve of homosexuality. But it has. The Sexual Offences Act of 1967 was not meant to lead to a state of affairs where it is increasingly dangerous to say anything critical about homosexuality. But it did. And the laws of Britain, being entirely based upon the Christian Bible, were not meant to be used by a sneering judge to declare that Christianity had no higher status in this ancient Christian civilisation than Islam, Buddhism or Hinduism. But it has come to that this week. How did it happen that in the course of less than 50 years we moved so rapidly from one wrong to another? Until 1967, homosexuals could be – and were – arrested and prosecuted for their private, consenting, adult acts. This was a cruel, bad law that should never have been made. It led to blackmail and misery of all kinds. Those who repealed it did so out of humanity and an acceptance that we need to live in peace alongside others whose views and habits we do not share. No such generous tolerance is available from the sexual revolutionaries. Now, as the case of Dale Macalpine shows, we are close to the point where a person can be prosecuted for saying in public that homosexual acts are wrong. And officers of the law, once required to stay out of all controversy, get keen official endorsement when they take part in open political demonstrations in favour of homosexual equality. We have travelled in almost no time from repression, through a brief moment of mutual tolerance, to a new repression. And at the same time, the freedom of Christians to follow their beliefs in workplaces is under aggressive attack. How long before Christians are being blackmailed by work colleagues, for daring to speak their illegal views openly? Daily the confidence of the new regime grows. The astonishing judgment of Lord Justice Laws last week, in which he pointedly snubbed Lord Carey, a former Archbishop of Canterbury, and mocked the idea that Christianity had any special place in our society, is a warning that this process has gone very deep and very far. The frightening thing is that it has not stopped, nor is it slowing down. What cannot be said in a Workington street will soon be unsayable anywhere. And if Christianity has officially ceased to be the basis of our law and the source of our state’s authority (a view which makes nonsense of the Coronation Service) who, and what – apart from the brute power of the manipulated mob – is to decide in future what is right, and what is not, and what can be said, and what cannot? This process, if not halted, will lead in the end to the Thought Police and the naked rule of power.